The ability to use Twitter to speak Truth to Power™ should not be understated. Twitter stands for freedom of expression. We stand for speaking truth to power. And we stand for empowering dialogue. I commit to using the privilege I currently have to always speak this truth to power, and to ensure the common good leads everything we do. Having watched the development of the F-35 and the difficulties with that program I asked General Chuck Yeager for his opinion on the jet. President elect Trump shortly thereafter tweeted about the cost overruns. Recommendations for Twitter, Twitter DC and government to facilitate the ability to speak with our elected representatives & government as follows. White House Administration and Senate/House Committees list Office Holders, Members and relevant Staff twitter accounts on the committee websites. 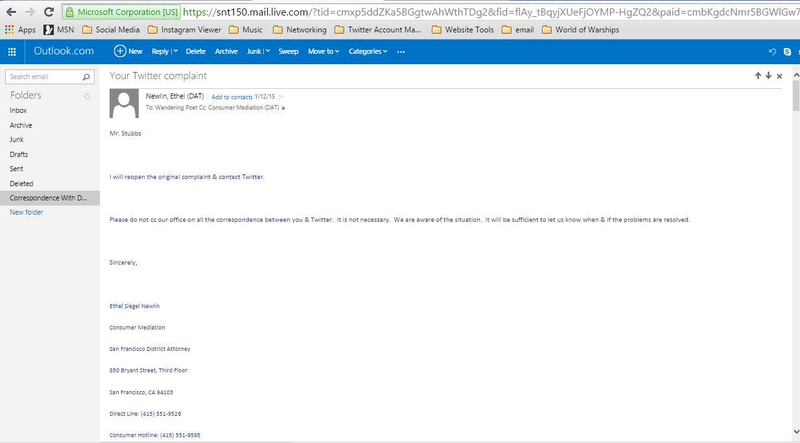 Twitter compile and make a database available of relevant office holders and staff twitter accounts across government. While professional journalists such as Kristen V Brown attend meetings where unionizing is discussed at professionally run internet based news sites there exists a darker, seedier underbelly of the internet. Many sites that are starting out essentially rely on volunteer labor. Volunteers not only write much of the content you consume on a regular basis, but form the backbone of the economic engine of growth for those websites. Despite the lack of formal employment, or employment protections young people looking to break into journalism flock to these sites and submit articles for the hope of exposure. Thus, as the news and media profession (and thus economy) moves online it’s time for basic employment protections for those volunteers who labor under often callous leadership of these websites. The more predatorial of the sites prey on college students eager for exposure even as they mock them in slack chats and other “team chat” sites where often unscrupulous, older “staff” or “management” heap abuse on the young, unchecked by inexperienced “President’s” and “CEO’s”. Congress regulates interstate commerce and should act to protect not just our nations citizens, but people worldwide from predatory practices. I had the good fortune to be contacted by the Facebook Social Network office and advised that I had won their lottery. Being a kind and generous soul, and knowledgable about Mr. Krohn’s difficulty I attempted to transfer my winnings directly to Mr. Krohn. Unfortunately I was judged unready for the winnings, and they have put Steves lotto winnings on hold. In other news, someone please tell Camden Martin that his facebook account seems to have been hacked. If something seems to good to be true, like you win a Lotto you never entered, it’s not true. Don’t hand out personal information to strange people on the internet. Internet cyberbully and EmpireKred leader Gareth Davies (@me_gareth) feels one unsolicitied email is spam, and uses that as a pretext to attack the facebook pages of businesses. Not only can EmpireKred not help you sell a pizza, according to Lynn O’Connell (@omdirect) Player Champion of EmpireKred, but their own leaders can hurt your business dramatically. @Accredoaus by spamming people ? 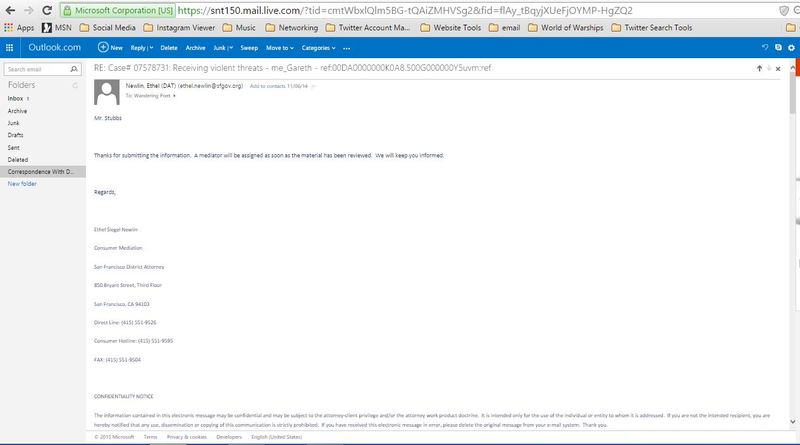 Gareth has attacked a business page of a new contact on Linked.In for sending him an email. Gareth Davies has been suspended by Twitter for doxing (tweeting private information) a customer of Empire Avenue’s (now EmpireKred) and violent threats. 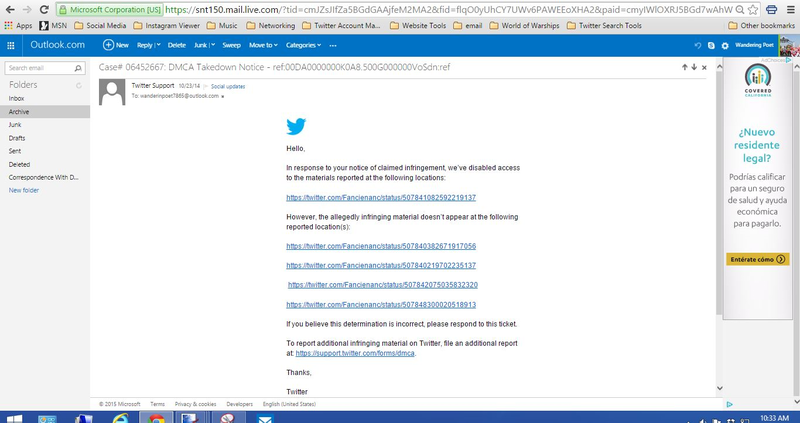 Additionally Gareth Davies was warned by Twitter for violent threats. Why would anyone in their right minds invite their friends to EmpireKred when such a vicious predatorial animal is present as a leader of EmpireKred? Value your friends safety and cybersecurity, it’s clear EmpireKred does not. They classify this behavior as “social media interactions” even though they are clearly prohibited by EmpireKred’s own Terms of Service. Save your friends! 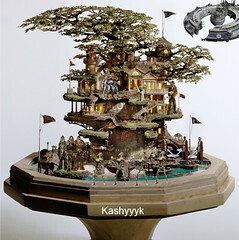 Don’t invite them to EmpireKred. You simply never know what will set off a timebomb like Gareth Davies. It’s clear they don’t value the cybersecurity and privacy of internet denizens despite their own Terms of Service provisions. Nance Larson, identified as “staff” by the Empirekred website and is an Admin in the “Welcome Wagon” forum (and Leader) participated in the doxing of a then Empire Avenue customer. Satire is harassment when he types and puts my head on Nazi uniforms. That's wrong. Nance needs to figure out who she is, and that other people now know. Unless they blog about it. Sadly Nance Larson does not define US, State or local laws on the state of satire or parody. Nance Larson is also a major, major plagiarist. 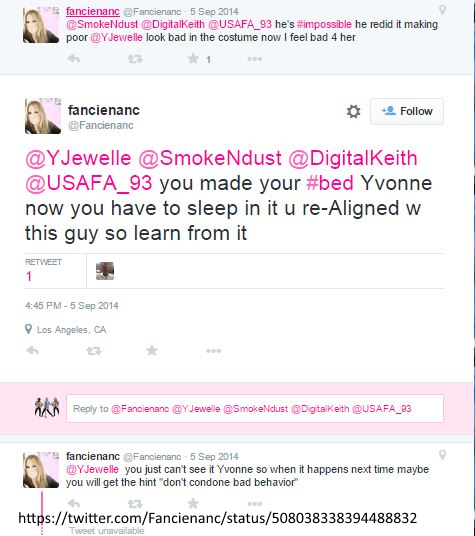 At the time of this post she was attacking other players (customers) of Empire Avenue in the (eav) elders forum. She later unilaterally deprived a paying customer of his benefits because he shared a social media blog she didn’t approve of. It’s clear power went to Nance Larson’s head, and the depiction of her as a nazi or communist (apparently if you don’t think and act to Nance Larson’s approval she will punish you) is entirely appropriate. She went mad with power, I believe. 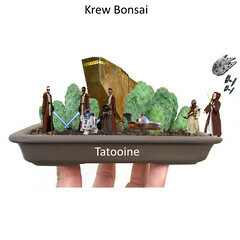 How others see what being a customer of Empire Avenue (now EmpireKred) is like. 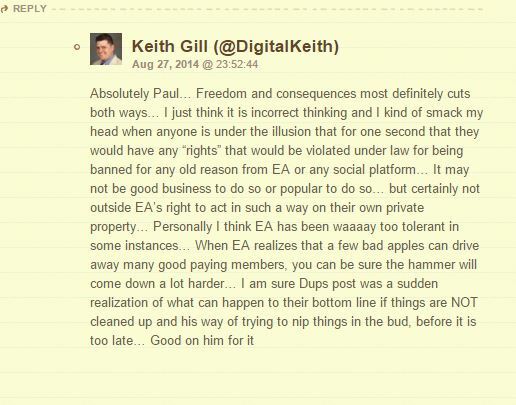 Keith Gill, AKA Digitalkeith has been moderated by Instagram for cyberbullying. Want to expose your friends to these people? Email them an invitation. 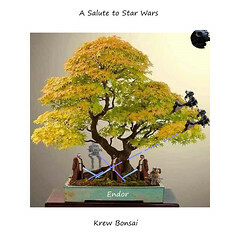 “Join Empire.Kred Today” the headline screams. The author is identified as Nance Larson. The affiliate referrer link is provided at the bottom of the blog. 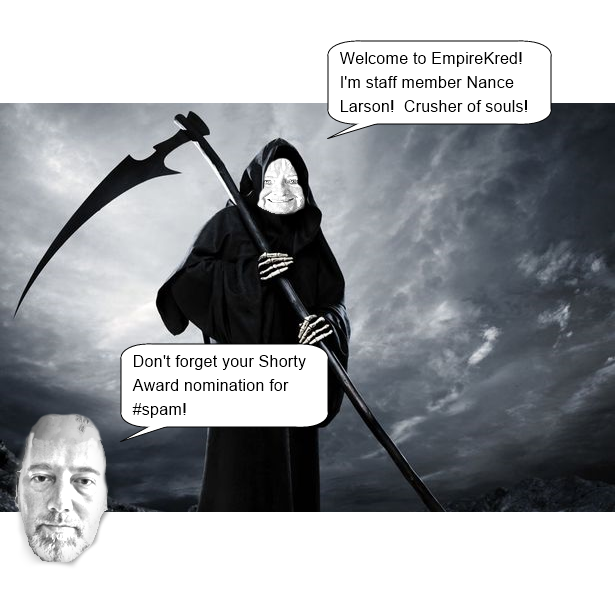 We have inquired if this is THE Nance Larson, who is an affiliate referrer of EmpireKred, admin of the “Welcome Wagon” forum (identified as EmpireKred staff by popup on the site) and leader (former team leader) who was gifted the leaders package promoted as follows and removed people unilaterally from benefits they paid Empire Avenue $100.00 for. What do affiliates earn? A percentage of what players spend. (Nance Larson seems to share something in common with Michael Q. Todd, They fail to clearly disclose they are afilliates of Empire.Kred in their blog posts. Truth be told I did not pay to join EA Leaders, I was gifted in. Twitter allows you to drill down to a targeted audience that will largely find the target audience you choose if you take time to set the parameters for an ad run. Rather than a general run, take the time to FOCUS, and the results can be there. This will potentially largely avoid the problem of the fake accounts known to be prevalent on Twitter. 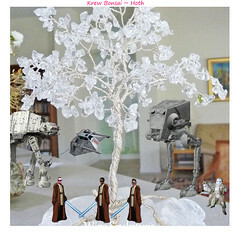 I think with my finetuning I avoided the fakies and fiverr RT buyers and hit a real audience. So you can see the quandary for a large agency contemplating a large ad run. Can they hit their target audience on twitter, with proper finetuning, or will they hit a sea of fake accounts that have no intention of engaging, and no intention of doing anything but looking for the next fiverr gig from Keith. Three Tweets did pretty well! And the data. The amount of my ad buy and other super secret data has been redacted. As i said it was a small buy. Organically the tweet did quite well. And tweet 3. Again just as well organically (if those are real accounts) versus targeted ad. A 9 percent rate, on a pretty small sample. This is @wanderinpoet reporting, digging and signing off. Read about it on Twitter? According to Rob Zaleski, writing for Mark W. Schaefer of Grow, Empire Avenue crushed his soul. Empire Avenue is powered by fakes, spammers, and desperate “gurus” I used to admire until I saw their true colors show on this platform. Here I am, thinking I’ve been failing at blogging because I’m not getting tons of engagement, when it turns out I’m apparently just not bribing people. 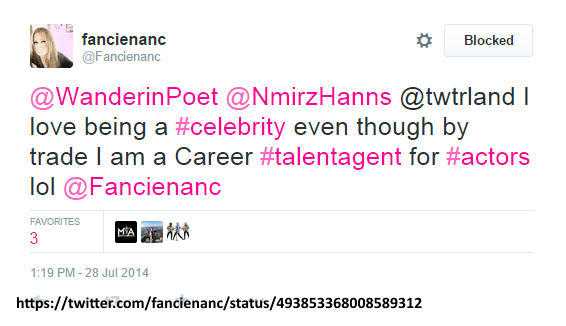 One such spammer and plagiarizer, Nance Larson, is on staff. Just yesterday Nance Larson took down her wordpress blog after I reported on her long term plagiarizing. I stand corrected. I deleted the site. Noted social media expert Gareth Davies has nominated Nance Larson for a shorty award in spam, as well. I nominate @NanceLarson for a Shorty Award in #spam because she deserves it !! If you wonder why EmpireKred has the reputation it has, look no further than their own staff member, Nance Larson. That seems to be his problem, he thinks his opinion is fact. Most of the major social media corporations are headquartered in CA in the bay area. This is true for Google, Twitter, Facebook, Instagram. I’m sure the list goes on to minor social media platforms as well. Apparently Keith Gill has never heard of the San Francisco DA’s office Consumers Protection Unit or the CA DoJ. Consumer protections exist to protect consumers from such seeming “corporate psychopaths”. 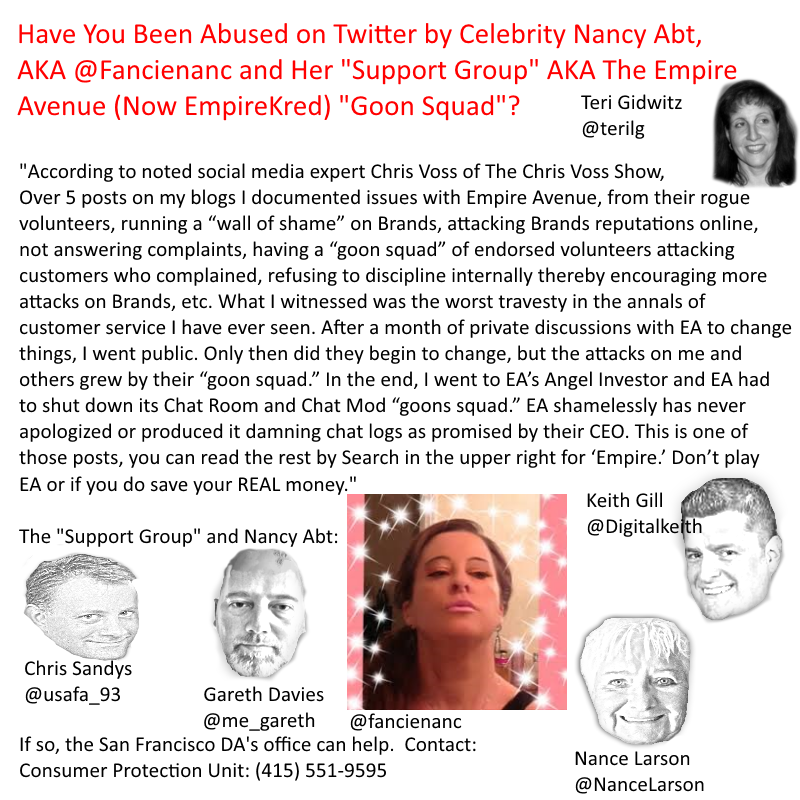 Have you been abused by the EmpireKred “goon squad” on social media sites headquartered in California? Don’t listen to corporate disinformation. The forms are for everyone. @WanderinPoet You were not buying Retweets until recently. Sad no one retweets you. That form is for paying consumers. 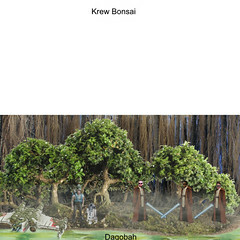 I am not interested in what staff of EmpireKred and leaders are learning. I’m interested in consumers being informed of EmpireKred, a business open for business in the great state of California. Who's perfect reading this? Not one of us. We are make mistakes. Some will learn by it others won't. I learned. What have you done? That’s right. It’s not. Capitalism relies on informed consumers not abused by corporate leaders. 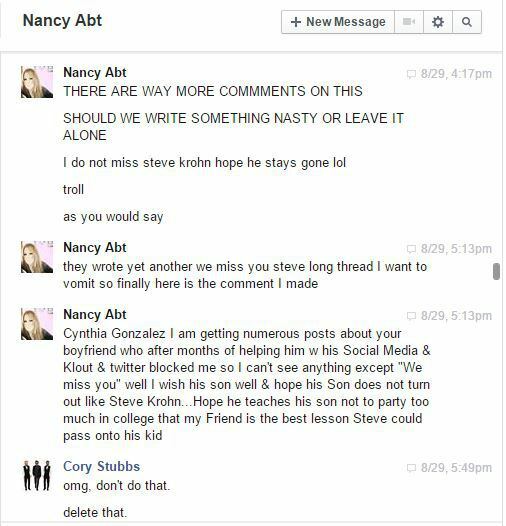 Celebrity Troll Nancy Abt and her “support group” have an astonishing record of cyberbullying, doxing, trolling fathers and their kids and issuing threats on Twitter. 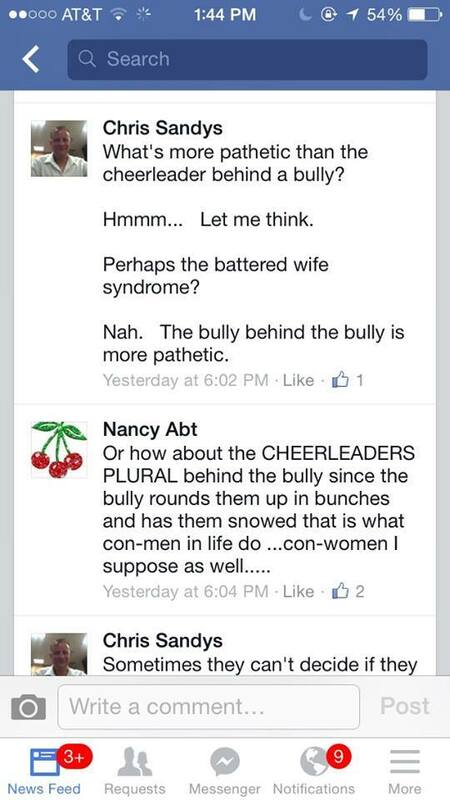 Who is the support group engaged in this activity with Nancy Abt? According to court documents, Chris Sandys, Gareth Davies, Nance Larson and Keith Gill. One common denominator between the “support group” is that they are all leaders at EmpireKred. Nance Larson is also on staff at EmpireKred. 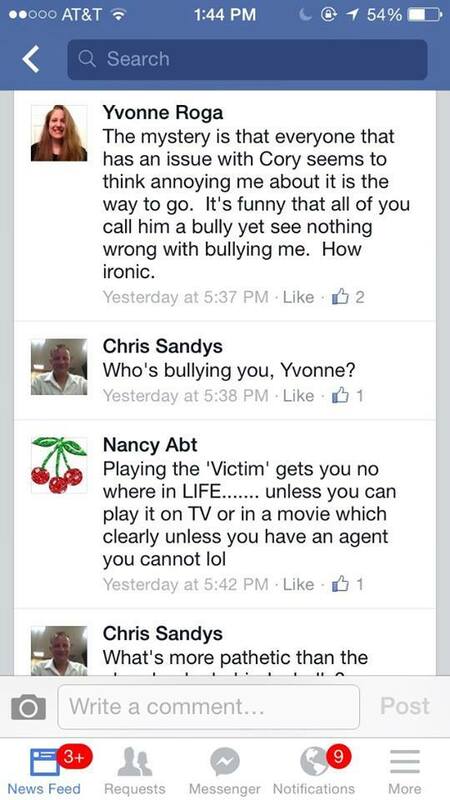 When I removed Nancy Abt for trolling on facebook from my content, she set about bullying her friend on Facebook and on Twitter to teach a lesson of some sort. I should say that she removed herself. 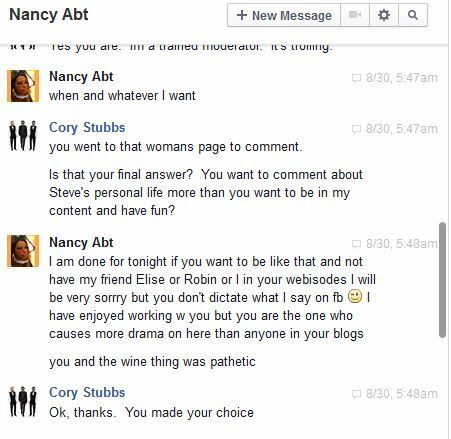 I explained to Nancy Abt why I wasn’t comfortable with her mean trolling attack and asked her to delete it. When she refused she gave an ultimatum. So ultimately I removed her, and her friends who hang out with abusive people from my content. Nancy Abt seems to have forgotten that she gave me the headshots and she wanted to be in my content. Yvonne Roga was also a customer of Empire Avenue’s. Amazingly enough Valerie Gray managed to pick a side. Imagine that, the corporate shill blogger came down on the abusive liars side. Nancy Abt seems to confuse fun pictures on the internet with reality. 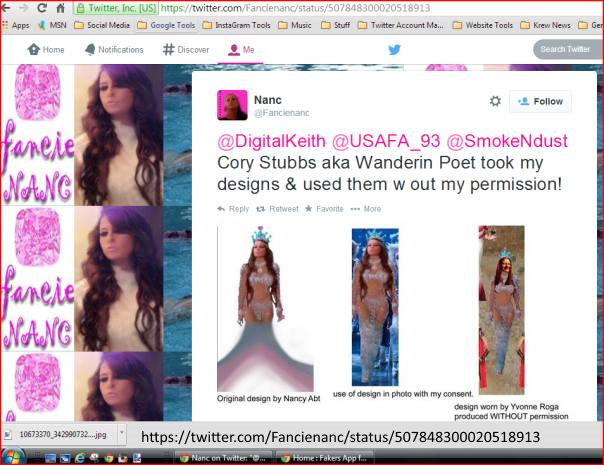 http://t.co/PqHMkEIYe3 Cory Stubbs aka #WanderinPoet is a Cross-Dressing #Internet #Celebrity & still #trolling & #Stalking People! #Read! She falsely claimed I had stolen her design (it’s a Victoria’s Secret Original) and made an astounding number of false allegations on twitter as she attempted to get whatever revenge she was after. Twitter has honored my DCMA takedown, and this tweet has been deleted. 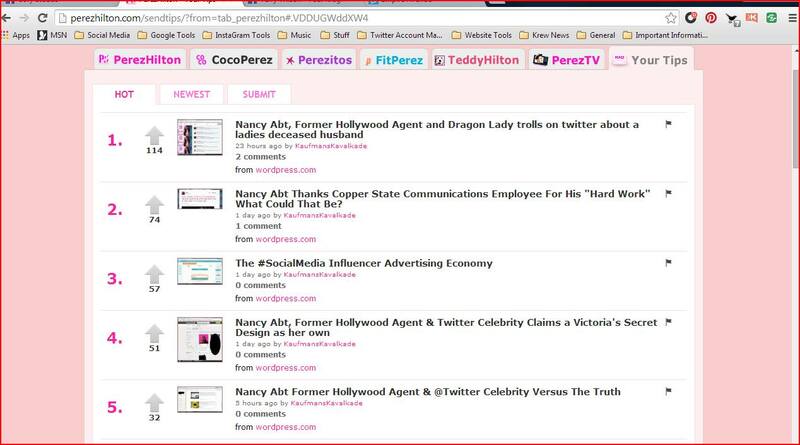 Nancy Abt, self admitted celebrity has trended on Perez Hilton. This does not seem to be available or offered to regular consumers and might explain my difficulty of reaching responsible parties at Twitter such that I had to involve the SF DA’s office and CA DoJ as Twitter was largely unresponsive. 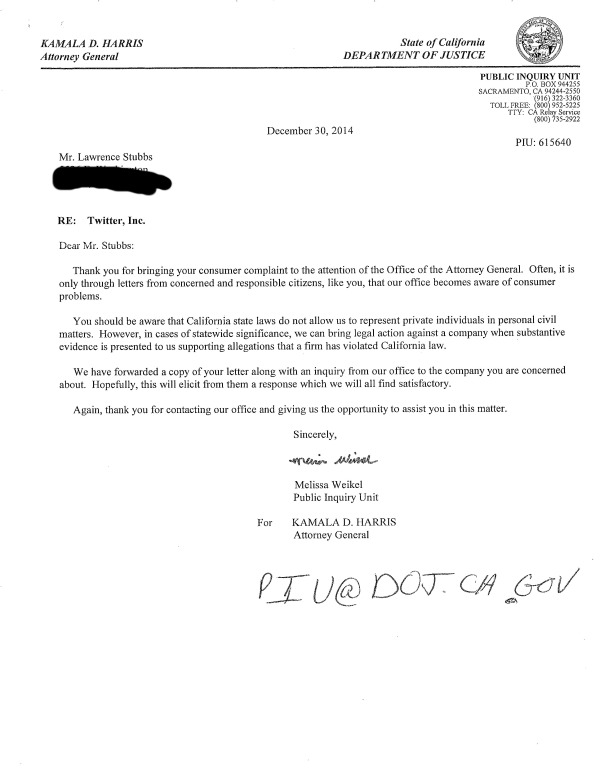 The San Francisco DA’s office twice opened files and the CA DoJ opened an inquiry into twitter’s handling. One can only wonder why such people remain on Twitter. One can only wonder at Valerie Gray’s seeming close association with Nancy Abt and gullibility at believe an astonishing liar. 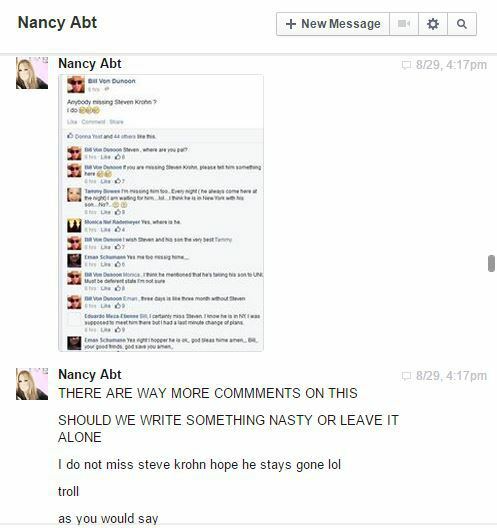 Nancy Abt has been “warned” on Twitter for non violent threats. 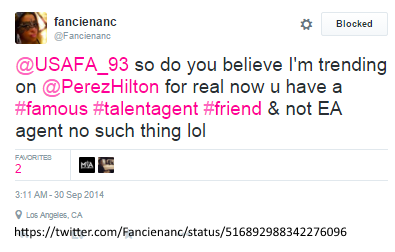 Nancy Abt remains one of the most dangerous, conniving, manipulative liars I have ever encountered in my life. 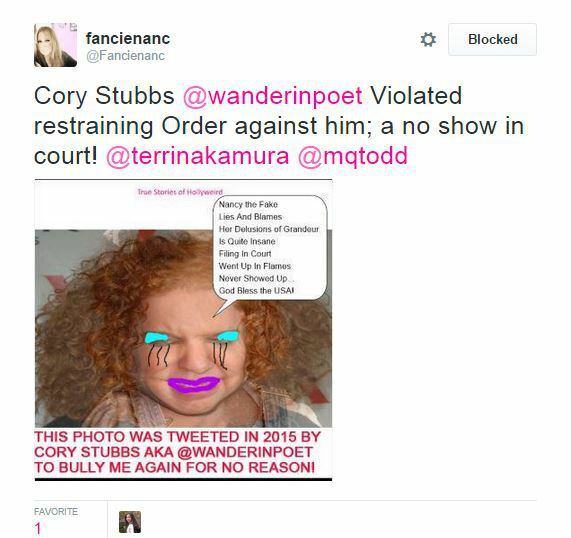 She even falsely claimed having a restraining order on Twitter in multiple tweets. We continue to hope Nancy Abt gets the hope she needs and is out of hiding from workers’ compensation subrosa investigators. 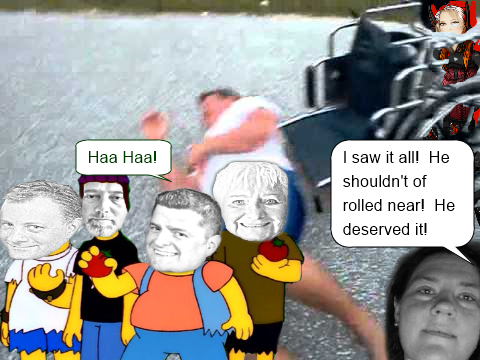 Given her propensity to lie and make false allegations, I figure it’s only right that I speculate on what she and her “support group” might have done. They seem like the kind of people that are extremely abusive, what with the cyberbullying, threats and doxing. Perhaps they like to push people out of wheelchairs?